‘Spoiled’ – Anna Nicole Smith’s court appearance slogan tee becomes the manifesto of a 60s-inspired girl gang. 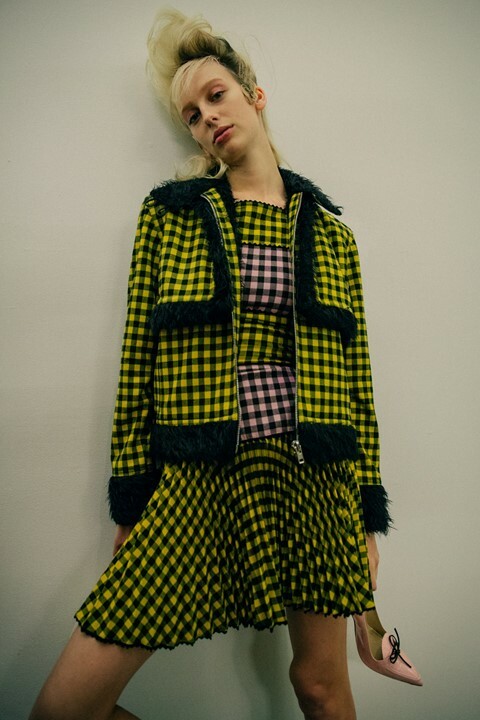 Drawing inspiration from John Waters’ cult flick Female Trouble, Selman’s brassy AW15 collection was a love letter to retro teen rebellion. On the runway models leaned against a chainlink fence like the bad girls at school – think hiked up skirts, smuggled in cigarettes and a rendezvous behind the bike sheds with a greaser boyfriend – Cry Baby’s Wade Walker, perhaps? Much like the Pope of Trash’s leading ladies, the beehived bad gals owned the night in seductive knitwear and dark gingham separates, topped off with cat-eye shades. The Dazed 100 readers’ favourite, NYC-based actress Hari Nef, walked amongst the tribe of temptresses with a “dare to mess with me” snarl.